The term ‘algorithmic’ has blossomed into a word that seems to be popping up everywhere these days. We see the term used in relation search engines, spreadsheets, and now the financial industry. In stock trading, algorithmic trading — also referred to as algo trading, automated trading, or robo trading is becoming a popular trend in the industry. In this blog, we will be taking a closer look at algorithmic trading, reviewing what it is, it’s advantages, and how it can be applied. Algorithmic trading is a trading strategy that involves the use of additional technical tools for trading transactions. Algorithms are computer programs that can expedite and automate the decision-making process in trading. This can make a financial advisor or investors job easier, as some of the hard work is being done already. Algorithmic trading uses various mathematical models to quickly process the exchange information, which then increases the productivity of transactions and helps reduce the human influence on trading decisions. These models can investors determine whether to buy or sell a holding at a certain time. Algorithmic trading results in a more accurate trade that hopefully reduces the transactions costs advisers are often hit with. When was algorithmic trading created? Algorithms were first introduced in the late-nineteenth and mid-twentieth centuries. However, they did not gain popularity until the New York Stock Exchange began to allow automated orders in the 1970s. During these times, the premier technology was only available to successful investors who had a significant amount of financial and intellectual resources. However, thanks to technology and computer processing advancements, the share of transactions completed with algorithmic assistance is growing each year. Today, any investor or financial advisor can develop an algorithmic trading strategy with a personal computer. 80 percent of all orders in the US is done with algorithmic trading. There are plenty of reasons why more and more advisors are beginning to use algorithmic trading. 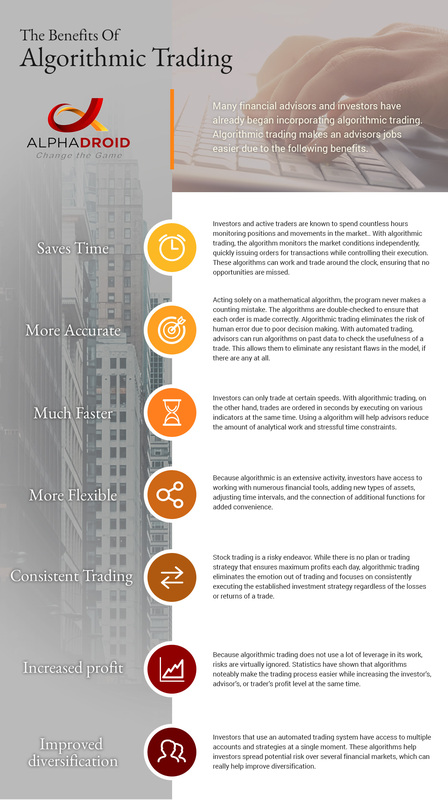 Algo trading not only makes an advisors job easier, it also comes with the following advantages. Investors and active traders are known to spend countless hours monitoring positions and movements in the market. During this time, investors use the skills and knowledge they posses to implement their strategies. This not only takes time, but it can limit them to only being able to focus on one strategy. With algorithmic trading, the algorithm monitors the market conditions independently, quickly issuing orders for transactions while controlling their execution. All this is done without the need of participation from the investor. These algorithms can work and trade around the clock, ensuring that no opportunities are missed. Since the program acts solely on a mathematical algorithm, it never makes a counting mistake. The algorithms are double-checked to ensure that each order is made correctly. Algorithmic trading eliminates the risk of human error due to poor decision making. Even if traders were to regard the signal as enigmatic and skeptical in the selection process, the program would still have the advantage as it does not miss profitable trades. With automated trading, advisors can run algorithms on past data to check the usefulness of a trade. This allows them to eliminate any resistant flaws in the model if there are any at all. Investors can only trade at certain speeds. With algorithmic trading, on the other hand, trades are ordered in seconds by executing on various indicators at the same time. This is because objective market analysis and qualitative risk assessment are executed every second. For humans, it is impossible to perform this fast. Using an algorithm will help traders reduce the amount of analytical work and stressful time constraints. Because algorithmic is an extensive activity, investors have access to working with numerous financial tools, adding new types of assets, adjusting time intervals, and the connection of additional functions for added convenience. This can help simplify the portfolio management process. Stock trading is a risky endeavor. Any investor involved in stock trading should expect losses. Every investor or advisor has experienced a painful loss during some point in their career, oftentimes which will lead them to modify their strategy. This can end up hurting investors even more! The key to long-term success with trading is to patiently analyze the stock markets, identify strong market trends that are likely to repeat themselves, and design a strategy around that While there is no plan or trading strategy that ensures maximum profits each day, algorithmic trading eliminates the emotion out of trading and focuses on consistently executing the established investment strategy regardless of the losses or returns of a trade. Because algorithmic trading does not use a lot of leverage in its work, risks are virtually ignored. Statistics have shown that algorithms notably make the trading process easier while increasing the investor’s, advisor’s, or trader’s profit level at the same time. Investors that use an automated trading system have access to multiple accounts and strategies at a single moment. Because this would be impossible for a single trader to manage, many large firms have started using trading systems because they can do so much more in a shorter amount of time. These algorithms help investors spread potential risk over several financial markets, which can really help improve diversification. Trend Following. Trend following is one of the simplest strategies to follow market trends. It is based on identifying the trend dynamics of asset price values, with the assistance of numerous mathematical indicators. This strategy can compare historical and current data in predicting the direction in which trend are likely to move. Mean Revision. Mean revision strategies are built on the concept that requires the a price to return to specific average levels, provided that enough time has transpired. Many investors utilize a mean revision strategy to determine the estimated middle price level. High-Frequency Trading. High-frequency trading is a strategy that operates quickly, carrying out buy or sell signal and closing trades in a matter of milliseconds. This strategy enables users to implement other algo trading strategies at speeds that are beyond the capabilities of a human. This strategy often uses arbitrage or scalping trading strategies depending on the fast price changes and high trading volumes, variations in the prices of options, or futures for one basic asset containing numerous expiration dates. 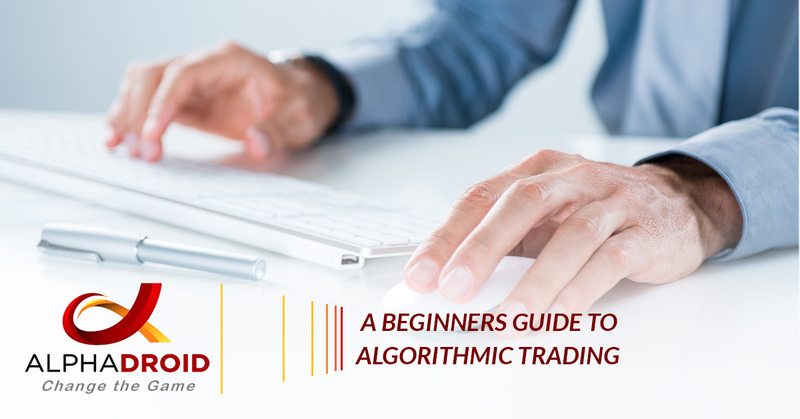 Ready to apply algorithmic trading? If you are an investor, advisor or trader who is ready to start algorithmic trading, start with AlphaDroid! AlphaDroid is a premium financial portfolio management tool that uses algorithmic trading strategies to help advisors and investors indicate the returns and risks of a client’s portfolio. With AlphaDroid, financial advisors can better analyze, construct, and compare investment portfolios. If you want to make investing less overwhelming and complex, let the algorithmic trading do all the hard work for you.